Today Jesus tells his disciples: “I am the living bread that came down from heaven. Anyone who eats this bread will live forever.” However, he doesn’t stop there. Jesus continues: “The bread that I give is my flesh for the life of the world.” Each of these statements of Jesus must have been pretty outlandish to the people of his day. Today if an individual told us that they would live forever, most likely we would consider them a bit off their rocker! Yet Jesus then expands this analogy of flesh and blood. 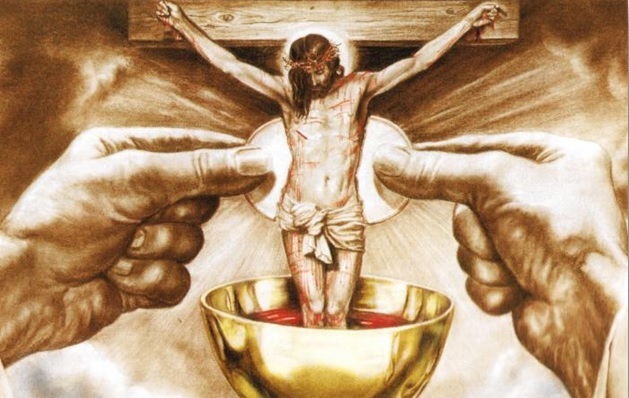 He tells his listeners: “Unless you eat the flesh of the Son of Man and drink his blood, you do not have life within you.” He also promises them that if they eat his flesh and drink his blood, they will have eternal life. And they will be “raised up” on the last day. Imagine how they reacted to this statement! Yet, what a wondrous promise, far-fetched though it sounds. When we receive the Body and Blood of Christ at Eucharist, are we truly aware of whom (Jesus) we are receiving? Or are we simply going through the motions? Jesus came to earth for us. Jesus gave his life for us. And Jesus gives himself to us every time we celebrate Eucharist and receive the Body and Blood of Christ. Do we appreciate this wondrous gift? Do we give thanks to Jesus for giving his life to save us? The miracle is that Jesus is still in our midst! He walks on this earth and is present to us. However, we have to have open eyes and an expanded heart to “see” him. Be awake today! He is in your midst!